The Destructor is a pro-gamer control surface. 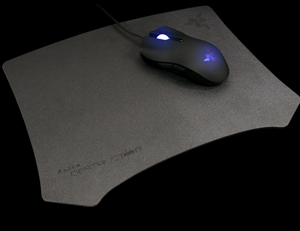 It’s designed to allow much more precise mouse control than a conventional mouse pad. In the month I’ve been using it, I can honestly say it does that very well. There is a surface on the Destructor that uses a propriety coating that allows for very precise and even mouse movement. I used both a standard Apple Mighty mouse and another Blue Tooth mouse, both optical, and found the results, when compared to a standard foam backed mouse pad, to be far superior. Large in size, it is about the size of a 15″ wide screen monitor. This allows for maximum movement, although on my desk half of the pad is tucked under my keyboard. The bottom of the Destructor has a rubber coating that makes it stick to most surfaces very well. The pad did not slip at all, even without part of my keyboard sitting on it, even during some hard-core Spacecraft action. It does ship with its own case, a hard plastic that protects it when traveling. In terms of aesthetics, this is a great looking control surface. True, all I can compare it to are standard mouse pads that I have used, but it really looks sharp. This thing works! I was a little dismissive of it at first, but after some time with the Destructor, I cannot imagine using my professional computer setup without it now. It really does make a difference, so either a pro-gamer or a graphic designer. If you have the $40, this is worth the investment.